In religion, students take their first steps on the path to developing their Catholic identity. They learn about God through Bible stories, prayer, hymns and attending weekly Mass. We base their learning on the most important rule, the Golden Rule “do unto others as you would have them do unto you” (Matt. 7:12). Our reading and language arts programs are designed to nurture a lifelong love of reading and communicating. 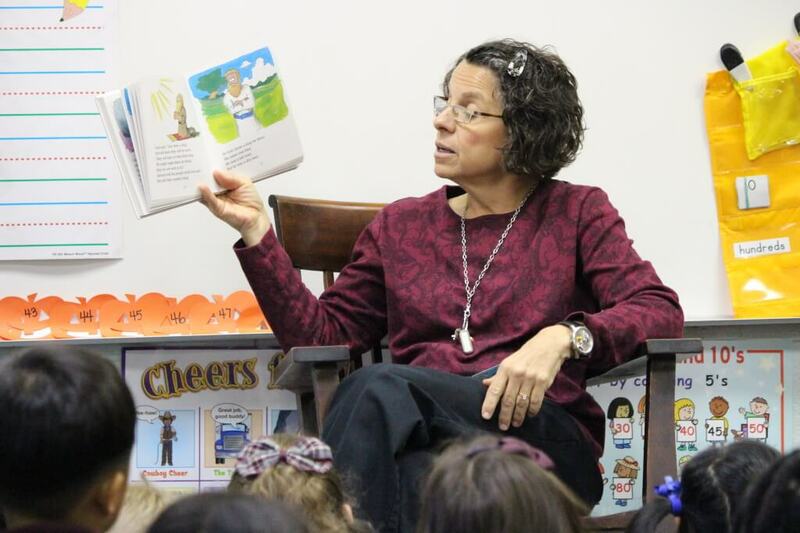 Reading is taught through visual, auditory and kinesthetic modalities such as singing, phonetics and the use of colorful characters in literature. This multi-model technique helps to simultaneously develop better reading and writing skills. Our reading program “Super Kids” uses a technology component that helps students add to their learning experience both in class and at home. The kindergarten math curriculum focuses on problem-solving and the understanding of fundamental mathematical concepts. Those skills are introduced in a concrete setting using various manipulatives such as blocks, games, dice and other objects to engage young learners. Most important, the concepts are related to student life experiences and how they apply to their own world. Throughout our science and social studies curriculum, students enjoy various experiences to develop their curiosity about the world around them. Some of those fun activities include planting seeds, graphing daily weather forecasts, making snowflakes along with many other STREAM experiments. Kindergarteners learn early the importance of homework in their education. Each student is given a weekly binder with a review of the assigned classroom work. Students are responsible for maintaining a journal describing a weekly topic and review math concepts through a program called Simple Solutions. All children love to see their parents at school and share with them what they are learning. Kindergarten parents are invited to assist our teachers during centers, a time when students get fun and creative hands-on exposure to whatever concept is currently being taught. We have developed so many ways to make sure our youngest students feel comfortable, secure and empowered. They immediately are paired with an 8th grade "buddy," who sits with them in Mass. They also come to class to read and help write stories with our kindergartners. Together they attend the annual Fall Festival and Thanksgiving Feast. Each spring our kindergarteners collect baby items to donate to the nonprofit organization Birthright of Atlanta.